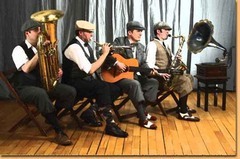 "With an unorthodox combination of instruments, the professional Hot-Jazz-Quartet from southern Germany plays music from the 'golden twenties'- pleasurable, brassy, irreverent, self-ironic - and in knickers! The amazingly colorful repertory includes hits from the old film- and Hollywood times, also wonderfully ludicrous Charleston street ballads like 'Ausgerechnet Bananen' ('Yes, We Have No Bananas') or 'Mein Papagei frisst keine harten Eier' ('My Parrot eats no hard-cooked Eggs'). Louis Armstrong and the swing of Benny Goodman are also not ignored. The mixture is jazzy, masterfully prepared, jazz and fun are tastefully interwoven, and perfect solo-and-group singing add that special touch. Dixieman Four has undertaken to appear in several TV productions and live radio transmissions, has performed in jazz festivals, both in Germany and other European countries, and in jazz clubs as well as cabarets. In addition, the Quartett appears with regularity as the main attraction on Bodensee cruises on the only remaining paddle-steamer 'Hohentwiel'."